Over a dozen people have come for this, and their backgrounds range from martial arts student to fighter to coach. There's even a guest of honor in the form of newly-minted NYS Athletic Commissioner John Signorile. He stays for the first hour, and gets to see us take the first written exam of the day, an exam that involves Sambo Steve and his fighter Hassan Hope demonstrate 20 basic-to-esoteric submission techniques while we write down what they are (recognize the Twister below?). 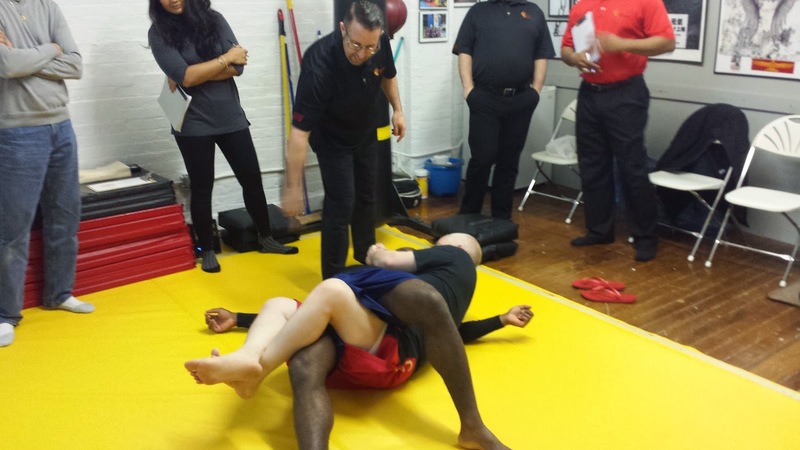 Last month I attended one of the New Jersey State Athletic Control Board's in-house training seminars, which was a refresher course for the referees, inspectors and judges who'd be working UFC 169 in Newark. But this particular class is eight hours on judging alone. Who knew there was eight hours worth of stuff to learn about judging? I sure didn't. And yet there was. 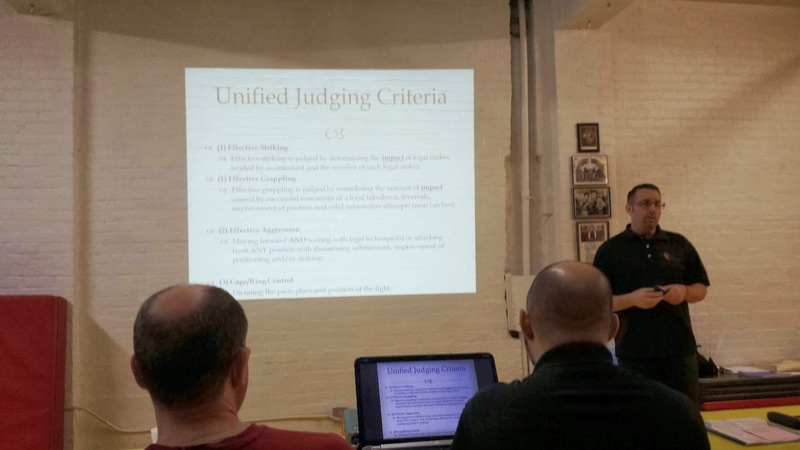 Rob walks us through the judging criteria found in the Unified Rules, and breaks down the order in which the criteria is to be used. He describes the types of "impact" that a judge will be assessing, goes in-depth on the 10-point "must" scoring system and the use of 10-8 rounds, and even touches on some history (Rob's been around pretty much since the sport's inception here in the States). There are demonstrations throughout - some with Sambo Steve in Rob's guard, pretending to drop elbows (as a lesson in perspective and angles and what judges sometimes can't see), some with video examples. The written exam is a few pages long, and when everyone finishes, it's on to the practical exam. For that, we're each given scorecards and shown two tough-to-score five-round fights: Georges St. Pierre vs. Johny Hendricks and Benson Henderson vs. Josh Thomson. How did Rob's role as MMA educator come about? 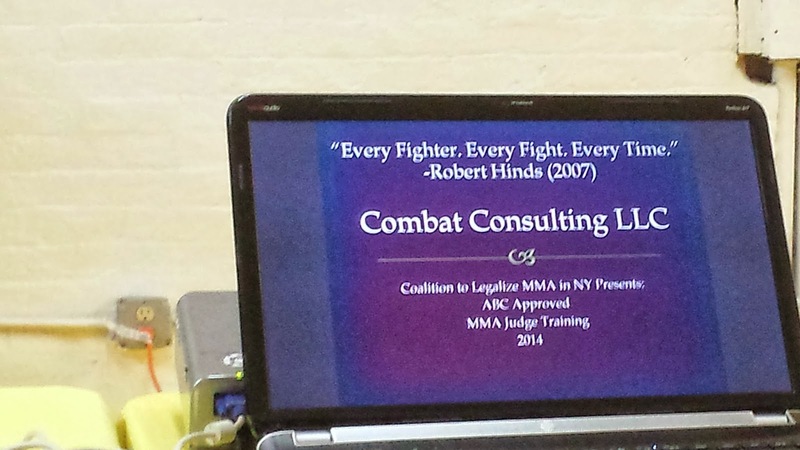 "In 2007 I came up with my company, Combat Consulting. And the first thing we did was we helped out at the amateur level, sanctioning events. In the sanctioning of events, I was doing kind of little training seminars for the officials that I would assign to the events, and it grew from there. So just from a sanctioning standpoint, providing quality officials for those little amateur shows, I started to realize that this was needed at all levels." Since he's been doing this for so long, I ask about the sport's evolution as he's witnessed it, and if there's anything he beats his head against the wall about. "Some of things I beat my head against the wall about... when it comes to rule changes, and athletic commissions really being on the same page with the same exact rules, the same qualifications for officials - those are the parts that are a bit frustrating but out of my control. But as far as the evolution of the sport, the athletes within it, and even some of the officials that have really taken the time to improve their craft, it's been an immense and really exciting evolution I've been through." I ask Rob if there's a particular goal he's working towards, and if there's an end game or terminal point in his quest to educate. "Hopefully it does go on forever, because education doesn't just stop with a seminar. A seminar is just the first step. It's the practice after the seminar, it's practicing what you preach, it's leading by example. I hope those things will never end. But the ultimate goal is to get everybody that's involved in mixed martial arts educated on the same process, procedures, rules, regulations, judging criteria all across the board. That's the goal." Due to time constraints I have to leave early - there's a fight show in Queens in a few hours, and as Snake Plisskin showed us, sometimes traveling from Manhattan to the Outer Boroughs can be problematic. It was a good, informative seminar that I recommend anyone with a thirst for knowledge about MMA judging take, and I thank Rob for it.